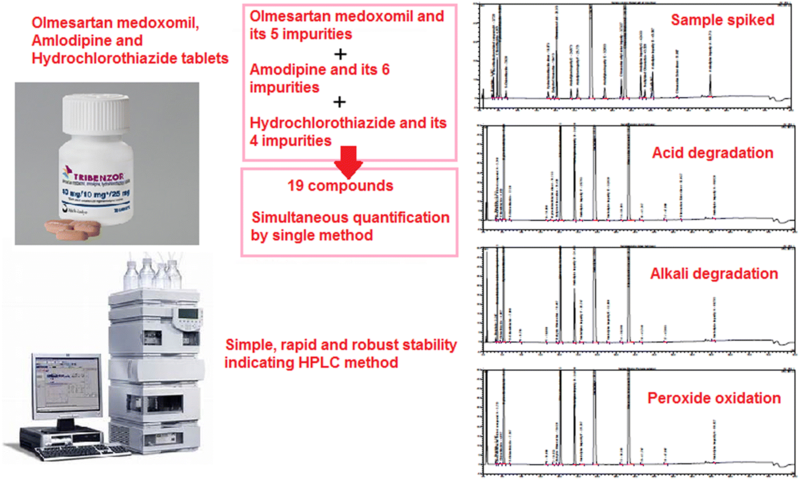 A novel, simple, robust and rapid reversed-phased high performance liquid chromatographic method has been developed for the separation and quantitative determination of the 15 organic impurities of olmesartan medoxomil, amlodipine and hydrochlorothiazide in combined dosage forms. 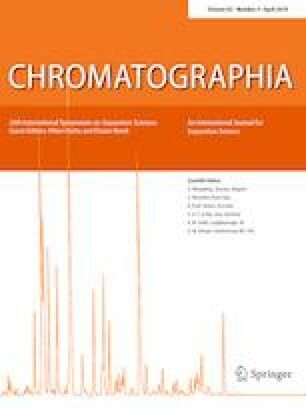 Successful separation of five impurities of olmesartan medoxomil, six impurities of amlodipine and four impurities of hydrochlorothiazide, and degradation products formed under stress conditions, was achieved on Inertsil ODS-3 (100 × 4.6 mm, 3.0 μm) column, using gradient elution. The mobile phase A contains 0.0 2 M phosphate buffer (pH 3.3) and acetonitrile in a ratio of (95:05, v/v%) and mobile phase B contains 0.02 M phosphate buffer (pH 3.3), acetonitrile and methanol in a ratio of (20:60:20, v/v/v%). Flow rate monitored at 1.8 mL min−1, and UV detection carried out at 237 nm. During forced degradation studies, the effect of acid, base, oxidation, UV light and temperature was investigated, showing good resolution between the peaks corresponding to process and degradation-related impurities. The performance of the method was validated according to the present ICH guidelines for specificity, linearity, accuracy, precision, ruggedness and robustness. To the best of our knowledge, this is the first research paper which presents a simple and rapid HPLC method, which separates all impurities of olmesartan medoxomil, amlodipine and hydrochlorothiazide in combined dosage forms. The authors of the current work wish to acknowledge the management of Zydus Cadila Healthcare Limited for supporting this work, and are grateful to their colleagues from Analytical Research and Development Laboratories. The authors declare that there is no conflict regarding publication of this paper. This article does not contain any studies with human participants/animals performed by any authors.